Everybody who likes real bbq will know this new hype by now! The concept is pretty genious. 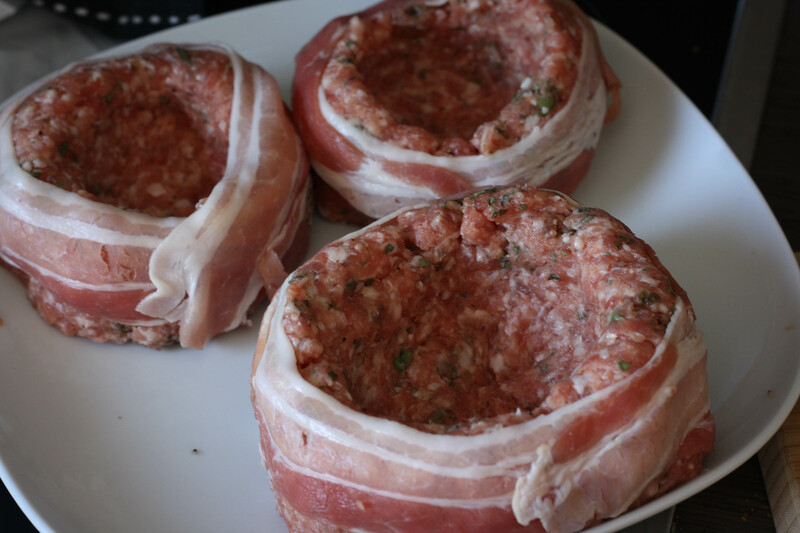 You take some minced meat, form them into large balls and press a beercan in them so they form fillable cups. Those following my old tumblr blog a while ago will have seen my attempts to stuff some meatballs with a broccoli sauce… The BBQ Pit Boys were a little smarter and cooler. 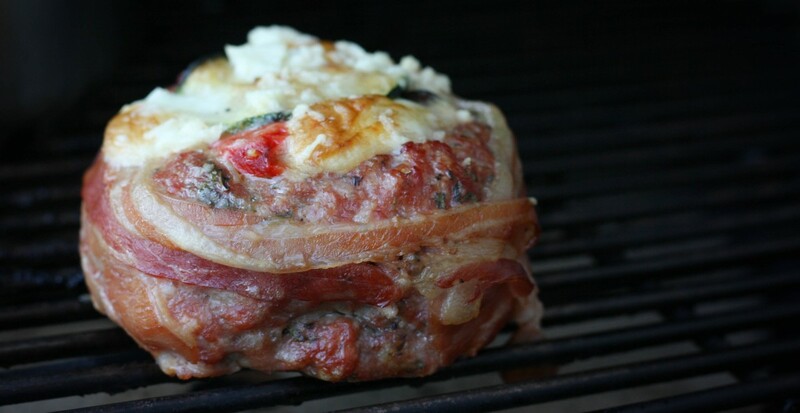 They spread this awesome creation called: “The Beercan Burger“. These burgers stimulated my imagination too. You can fill them with whatever you want and that’s what I liked most about them. One thing that makes me critical about all those videos and pictures I see passing by: too much heavy pounding fat cheese! In my opinion they take away the subtle flavours you could put in these burgers. But hey, if you like them that way, you should make them that way! That’s just the beauty of it all! I used the more subtle Mozzarella cheese and combined it with some other Mediterranean ingredients. This part is really important in the process! You start by making yourself a beautiful little boy or girl. Train him on being a sous chef so he can help you out with the preparation. I think I did a good job over here. My son helped me out on the hard part. First we mixed the meat with the herbs and formed some large balls. My little chef pretasted and decided to add some ground black pepper (Now you see why you needed 1.05 tbsp). As you can see this is the moment to wrap the bacon around your burger. Afterwards you carefully remove the bottle! To prevent your bottle from sticking to the meat you could wet the bottle a little. At this moment I realised I had been as unorganized as usual. I hope you read the recipe before you started, otherwise you’re cooking like me and you’ll have to wait untill your vegetables are grilled (don’t forget to put the burgers in the fridge if you’re in my position). 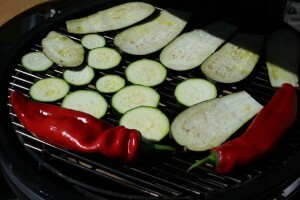 Before grilling I sliced the zucchini and eggplant and salted them to enhance the flavours. You’ll see the juices pearl if they are ready to grill. Make sure you’ve oiled your grill to prevent sticking! You can’t see on this picture but the peppers were on the grill before the other vegetables so they could burn. This makes them even better than they already are and helps to remove the peel! After the vegetables are grilled comes the fun part. Filling the cups. I put 2 layers of zucchini, eggplant, pepper and mozzarella. Once the burgers are filled they are ready for smoking. Place them in your bbq over indirect heat at 150°C for about an 1hr.15m. I used lemon wood. However the lemon wood produced some rich smoke they left only a mild flavour. After a half hour I added some grana padano cheese on top of the burgers and glazed them with bbq sauce (Smokin’ jones smokey garlic). I didn’t want to overrule the taste of my burger so I only used a little. The one in the back is without bbq sauce (Mrs. property) the real mediterranean beercan burger was mine btw. The other were actually beer bottle burgers (if you would have noticed). The result was pretty awesome! The combination worked well and we had some good tasting meal! The BBQ sauce even enhanced the flavours so I’ll add a little more next time! I was in a hurry to taste so I ended up with bad pictures from the inside… The roasted peppers nailed my burgers! Concerning proportions I think it’s hard to choose! The beercan burger was a little to big for me but has the advantage of being easyer to fill and holding more vegetables. If you haven’t made them by now I’ll advice you to do so! You can use this recipe but the possibilities are endless! Feel free to share yours in the comment section below! 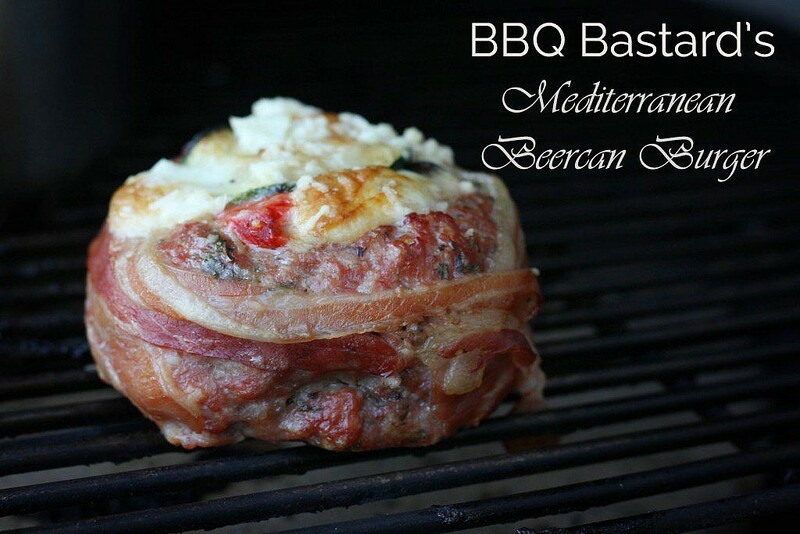 Liked this mediterranean beercan burger recipe? Hope you’ll hit the like or share button and spread the word! 1. Slice your vegetables and sprinkle them with salt. Let them rest while you start your BBQ for direct grilling. After +- 10 minutes you'll see the juices pearl on the vegetables! This will enhance their taste! 2. Once the flame is burning start by roasting your sliced vegetables until you get some nice sear marks! Put them aside and put the platesetter inside your BBQ (If you're using a kamado). For the following steps you need indirect fire from about 150°C/300°F. 3. 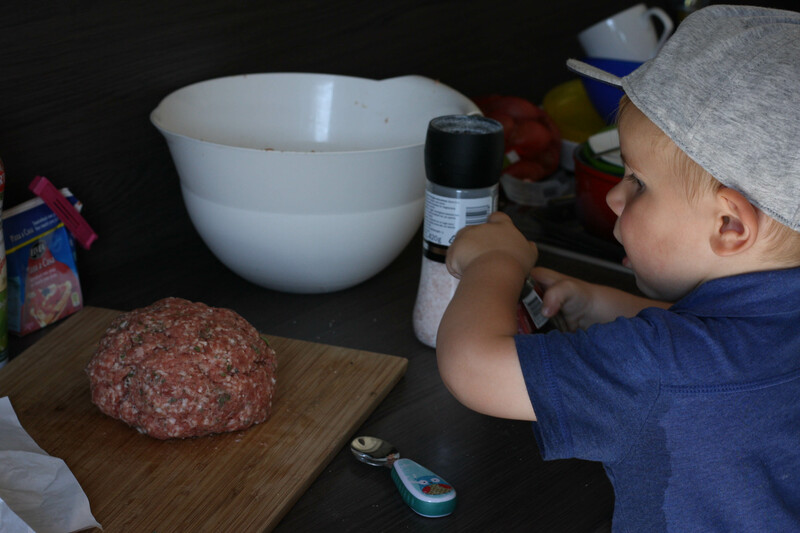 While the BBQ is getting the right temperature, mix the minced meat with the herbs and form them into balls. 4. 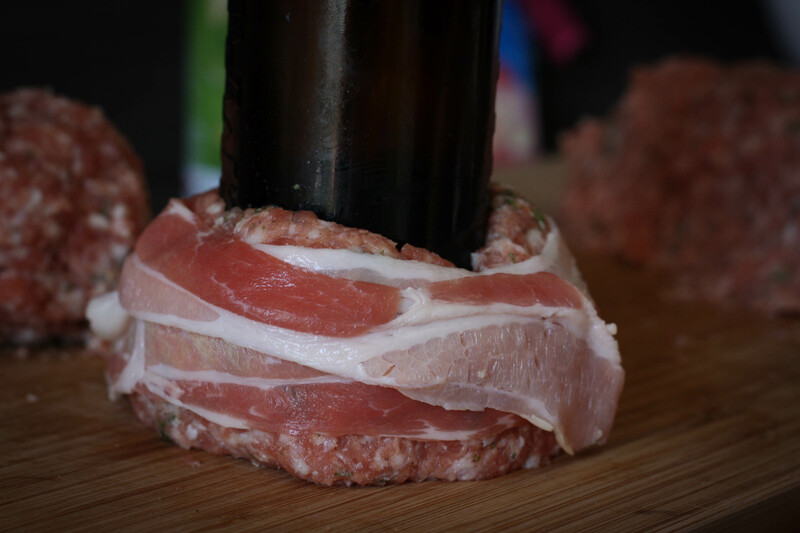 Put a whole in the meatball by placing a beer bottle or beercan in the middle of the ball (See pictures in the blogpost above). To prevent your bottle from sticking to the meat you could wet the bottle a little. 5. 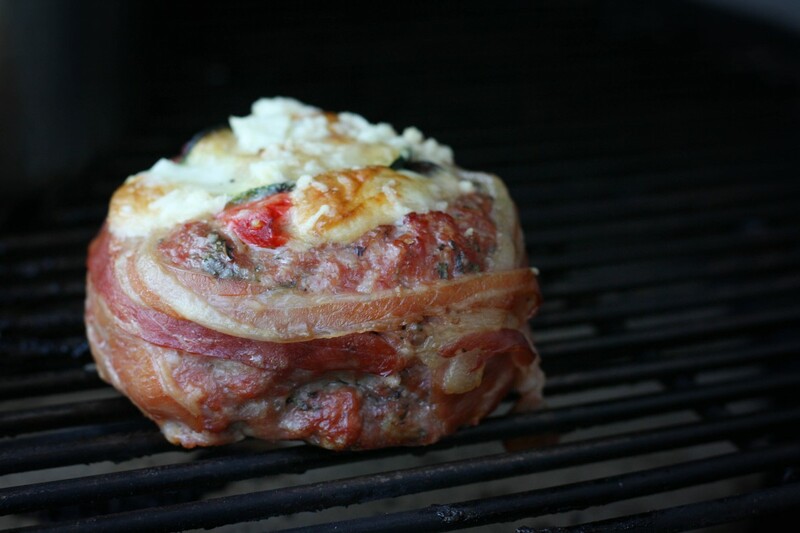 Wrap some bacon around the beercan burger and carefully remove the bottle or can. 6. 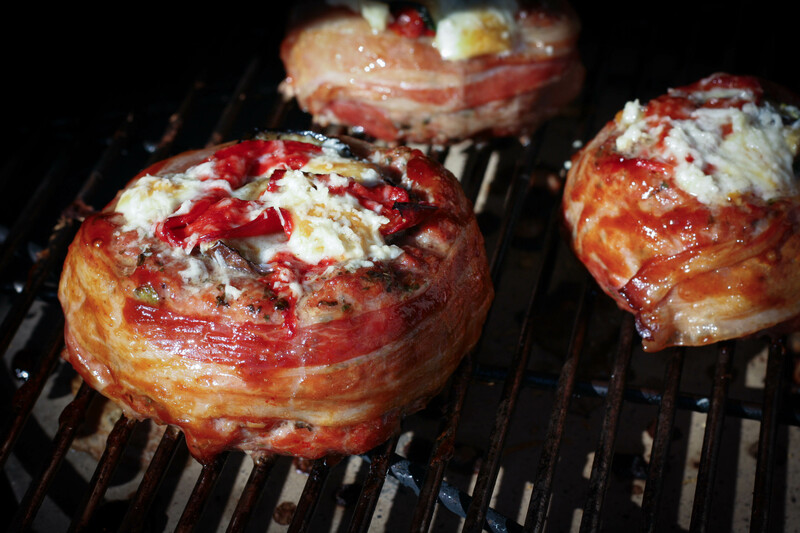 Start filling the beercan burgers with layers of mediterranean vegetables. I put 2 layers of zucchini, eggplant, sweetbell pepper and mozzarella. 7. Once the burgers are filled they are ready for smoking. Place them in your bbq over indirect heat at 150°C/300°F. I smoked them with lemon wood. 8. After a half hour add some grana padano cheese on top of the burgers and glazed them with bbq sauce (I used Smokin' jones smokey garlic). 9. About 1.15 h. after you put the Beercan burgers on the bbq they will be ready! Have a nice meal!